So I bought a couple of shipping containers and insulated one with 1 ½” ridged foam to use as a temporary shop. I noticed that the place always smells like popcorn at the end of a hot day. At first I couldn’t figure out what the smell was from because I’m over 60 ft away from my house and it just couldn’t be my wife cooking popcorn. Then I was in the non-insulated container and bumped up against the wall burning myself. So now I’m wondering if the foam insulation is burning and smelling like popcorn. I guess I’m wondering now if this maybe a health hazard. I am going to paint the outside with reflective paint, but maybe I should shade it somehow until that happens. Anybody hear of this before? The reflective paint sounds like a good remedy. Search You Tube for those kinds of issues when insulating shipping containers. Temps in locked containers often reach 150F and even more in direct sunlight. This is an idea but there are lots out there. Check with the manufacturer of the insulation about safety and health. I have some side wall vents that came with the container plus I have a whirlybird vent on the roof. The ribs of the container provide a 1 1/4"space to let air pass up the wall and over my top plate. 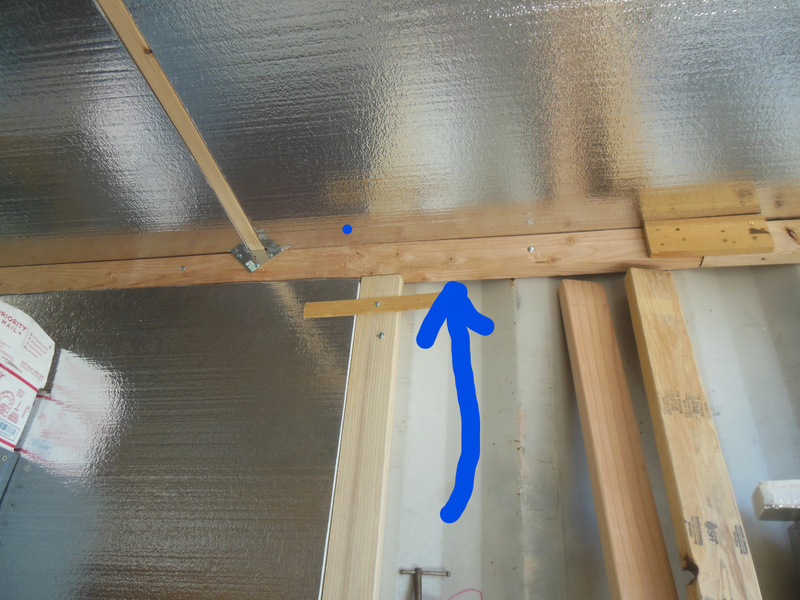 The whole space above the ceiling has a 2" space for the air moving up from the walls to move out the roof vent. there is only a small area between each rib that actually touches the foam. I just looked up the MSDF which says the Melting Point softens at 160 °F and Flash Point is 610 °F so It doesn't look like I have to worry about fire. I think you have to worry about that melting point. Well maybe that's what the popcorn smell is. I've cut this foam many times with a hot knife, but don't remember it smelling like this. I think I will remove one of the sheet on the sunny side and see if there are any sign of it melting. From the photo, it appears to be styrofoam insulation. Styrofoam is great for cold stuff, but it begins to soften around 165F, and has been show to leech chemicals (what you're most likely smelling) at temperatures as low as 120F. The Styrene (a petroleum product) in Styrofoam has been shown in various studies to potentially cause cancer, hearing and vision loss, mental decline, and various nervous system disorders. Bottom line: get that stuff out of there. You might build something out of eastern cedar to cover it up. Add a layer of 3mm radiant heat shield polyethelyne foam between the steel walls and styrofoam sheets - 4' x 100' roll available on Amazon for $0.45/sq ft.
Or, replace the styrofoam with PolyIso rigid foam insulation. Much higher thermal resistance than styrofoam (does not melt, even in open flame), has a typical R-value of 5.5 - 6.5 per inch, is class 1 fire rated, will not catch fire without open flame, and is self extinguishing once fire is removed. R-Max among other brands, has aluminum foil on both sides for radiant barrier instead of that polyester film that's on the styrofoam board. The odor is there because the foam board is new. It's offgassing just like paint drying. Everybody talks about the new car smell when the buy a car but in reality it's all the plastic offgassing. In time it will go away. If it bothers you put a fan in front of the door blowing in when you first open up the container. It shouldn't take very long to dissipate the fumes. I just finished pulling a sheet out from the hottest side where the sun is all day long and there are no signs of melting at all. I did notice a large date stamp on the edge saying Dec '18 so they were just manufactured a few months ago. It also has a flammable warning on it, but I don't care about that because its going to be my wood shop were everything is flammable anyway. The foam board isn't going to ignite from heat from the sun. If you had a fire the fire would burn hotter and be harder to put out but it certainly won't spontaneously combust. It has a pretty pleasant smell.